Byungman Son is a designated instructor of Bongsan Talchum, important intqangible cultural property No.17 at the Korean Bongsan mask Dance Drama Preservation Society. 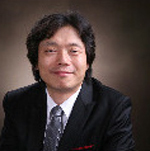 He is a graduate of the Korean National University of Arts and now serves as the president of the Creative Korean Traditional Mask dance Company and executive director of the Machun Korean Traditional dance Preservation Society. Currently he performs and teaches bongsan talchum and do-salpuri in Korea and abroad. The meaning of the word “ Talchum” is the Mask Dance but we might call it a “Korean traditional musical drama” because it has music and drama as well as dance. People love the drama because of the artistic touch of masks, the beautiful color combination of the costumes, the dynamic movement of dance, the dramatic music and satire of dialogues of interesting characters. “Bongsan Talchum”, The Bongsan Mask Drama was originally performed in Bongsan, Hwanghaedo, now in North Korea. As time goes by the original performers decided to establish the Bongsan Mask Dance Drama Preservation Society to train the successors. After the Korean War the broke out on June 25, 1950, Korea was divided into two. Fortunately the majority of the performers were able to escape to the south and they have made a tremendous effort to prevent it until the present day. The Bongsan Mask Drama has now received worldwide recognition. It was performed at Harvard University and the American Museum of Natural History in New York. After that they had a performance tour in Japan, China, France, Sweden, West Germany, Switzerland, Italy, Spain, and many other countries. In 1967, the Bongsan Mask Dance Drama was designated “Important Intangible Cultural Property No.17” by the Korean government. And today the successors of this masque are passing on their heritage to the younger generation. Four young monks are carried in on the back of other monks entering the stage one by one. After the young monks are set down and take their appropriate place on the stage, the other monks exit. The young monks stand in a line. When the music starts, each monk takes a stance to bow to the gods of the Four Directions. The start of the dance is solemn and ceremonial, the purpose being to ward off various types of evil spirits. While this scene is enacted, the first monk to appear in the second scene is seen lying face down on the stage. Instead of displaying asceticism according to the tenets of Buddhist doctrine, the eight monks prefer to engage in leisurely dancing and singing. Each monk enters the stage one by one and recites an ancient poem in-sync with the music. They dance lively around their circle to a 12/8 meter called kkaeki-chum. Each dancer’s poem and respective dance has its own unique characteristics. At the end, all eight monks join together in a dance that is light and nimble. A lavishly decorated Sadang, or dancing girl, is carried in by Kosas, or entertainers, playing the drums, another hourglassshaped drum and tabors. They dance around their circles with the Sadang in the center surrounded by the Kosas, while singing from Hwanghae province. In the first scene, an old monk spies on a splendidly dressed beautiful young shaman dancing on the stage. The old monk, who is regarded as like the living reincarnation of the Buddha, can hardly resist her very enchanting and skilled movements. He finally succumbs to her actions and falls deeply in love with her. In the second scene, a shoe-seller with a monkey criticizes the old monk’s hypocrisy and rebuking him for apostasy. In the third scene, Chwibari, or the prodigal monk appears and challenges the old monk, vying for the young shaman. The young shaman bears his child. A lion is sent by Buddha to punish the degenerate wavering old monks as well as the other eight. One of the monks Pleads with the lion for forgiveness, swearing that the monks will never commit such worldly act again. They are ultimately forgiven, and the monk and lion dance together. This scene depicts three brothers of the aristocratic class and their servants, Malttugi, who continuously teases and mocks them with audacious remarks and doubles entendre. He arranges a pig pen for his master’s lodgings but being as ignorant as they are, they fail to realize it’s a pig pen. This final scene concerns an old man his wife, Miyal. Miyal enters looking for her long lost husband. She comes across a musician and tells of her husband’s unattractive and unsightly appearance. When she exits, her husband enters looking for her. He also comes across the musician and tells of his wife’s unattractive and unsightly appearance. Knowing that the old man’s wife had just passed by, the musician tells the old man to call her. Miyal calls back and the old man and his wife are reunited. However, she finds a young and attractive concubine standing beside her husband the attractive concubine standing beside her husband. The tree get into a lover’s quarrel which becomes violent. Miyal is struck down and killed. A shaman ritual for the murdered wife brings the play to an end. video clip "Welcome to the world of Bongsan Talchum"
풀이 : 하늘에 제사를 지낸후에 손님을 맞이하면서 인사를 나눈후에 하늘의 뜻을 기다리기 위해 우선 사람들과 인사를 나눈다. 오동나무의 낙엽을 보니 가을이요 저 건너 푸른 소나무와 대나무에 흰눈이 내리니 이 어찌 겨울이 아니냐. 나도 원래 놀기 좋아하는 사람으로 산속에 있다가 좋은 악기 소리를 들으니 염불에는 뜻이 없어져서 한번 놀고 가야겠다. 이런뜻입니다. 한자와 고사성어가 섞여 있어서 처음 듣는 분들은 어려우실 수도 있을겁니다. 그래도 아는 만큼 보인다고 했으니 이번엔 오리지날로 들려 드리곘습니다..
8목은 인간이 할 수 있는 일을 다하고 나서 하늘의 뜻을 기다린다는 말이구요. 2목은 한국의 사계절을 잘 표현하면서 자신이 처한 사정과 왜 춤을 추는지에 대한 이야기입니다.